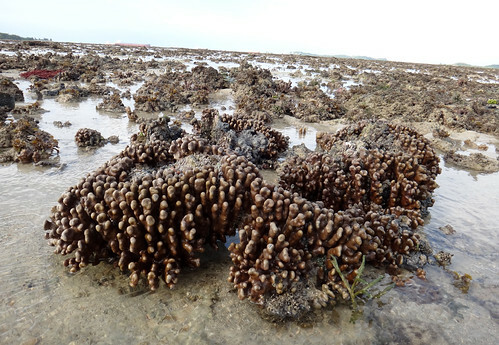 During ebb tide, the outer reaches of the reef to the west of Pulau Sudong are completely exposed and large areas of the reef are covered with shallow water. Groups of women row their kolek to different parts of the exposed portions of the reef to gather sea produce. In the past, this activity was performed with considerable gaiety, seeming to be an enjoyable activity. Everyone carried a basket and unmarried girls wore bunga raya (hibiscus flower) in their hair. In teams of threes or fours, usually to form a line, they combed the reef for agar-agar (an edible seaweed), gulong, the trepang and a variety of beche-de-mer. When both the tide and sun were low, the gathered chatter of the women at work would drift into the village where the men, excluded from the offshore merriment, conversed beneath their favourite pondok. The reef was called Terembu Raya (Big Reef) by the fishermen who set their small fish traps at the edge of it. The reef itself had always been the province of the women of the island. The men had no part in the collection of the plants and creatures of the reef but would help in the subsequent preparation of the gathered material for sale. For the women, the reef gave a source of income, a means of livelihood somehow made more efficacious by adorning themselves with a flower that bears the same name as the reef.